The Sears Hollywood was sold from 1914-1923. Nine years is a long run for a Sears model. 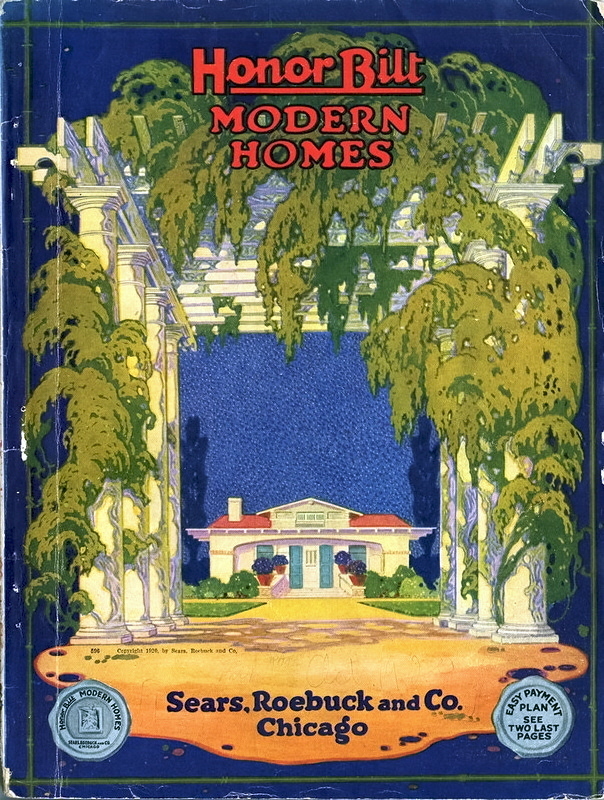 Sears even featured the Hollywood on the cover of the 1920 Modern Homes catalog. That's a teeny tiny Hollywood off in the distance. So you might assume that there were Hollywoods built all over the country, but this is not the case. I believe less than 10 have been located to date. Researcher Cindy Catanzaro believes it is strange that more Hollywoods have not been found. She writes: "Why would Sears continue to market such a seemingly unpopular plan? More than likely, this well-designed bungalow is hiding in small towns, or on country roads less traveled, where avid Sears house hunters just haven’t looked." The Sears Hollywood was offered with two different exteriors. The Sears Hollywood from the 1918 Modern Homes catalog. The Sears model No. 2069, which is the exact same house as the Hollywood with a different dormer and different exterior details. Most of the Hollywoods that have been found are in the No, 2069 style. "The Sears 'Hollywood' was first offered in 1914 as model 264P234. It was a copy of a bungalow pattern from the west coast by possibly an architect named Jud Yoho." Copied and borrowed are loaded terms. Every time I see them used by Sears house researchers it makes me cringe since they imply unethical behavior by the company. I think that if you're going to accuse Sears Roebuck of copying house plans, you better have some proof to back up those assertions. The Hollywood is identical to a plan created by Chicago architect Henry Lawrence Wilson that he called the No. 466. Model No. 466 from 1912. Does this look familiar? Henry Lawrence Wilson in 1910. Wilson advertised the No. 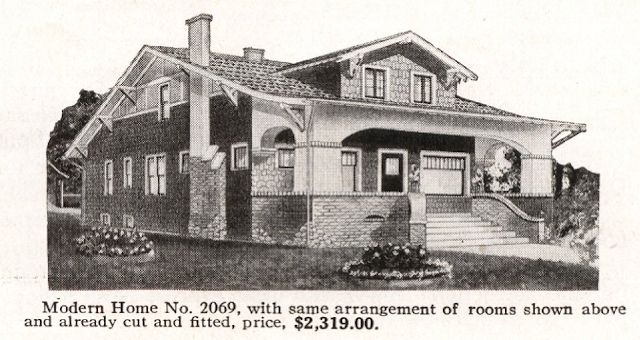 466 and other house plans in a national publication called Bungalow Magazine. It was $1 for the magazine, and readers could pay between $10 and $15 for blueprints and materials lists. The earliest I could find the No. 466 model advertised was 1910. So should we jump to the conclusion that Sears illegally copied the plans for the Hollywood from Wilson? Wilson sold Bungalow Magazine (and ostensibly the plans within) to real estate builder/developer Jud Yoho in 1912. Yoho, in turn, licensed several of Wilson's plans to Sears for inclusion in their 1914 catalog. One of these was the Hollywood. We have evidence to support the fact that Sears did not "steal" the plans from Yoho in the form of a public endorsement. Sears ad from American Carpenter and Builder, April 1915. Close-up of the ad with the Hollywood shown as one of the Jud Yoho plans. Close-up of ad text. Clearly Jud Yoho and Sears had a business arrangement. Sears likely paid his company a royalty for each plan sold. "This bungalow has been extensively noticed in several high class magazines and papers devoted to the building trade." Now we know that would be Bungalow Magazine. The hunt for Hollywoods continues. Cindy recently found a No. 2069 model in a small town in Ohio. 240 E High St., Hicksville, Ohio. Photo courtesy of Cindy Catanzaro. Photo courtesy of Cindy Catanzaro. Close-up of the dormer. Photo courtesy of Cindy Catanzaro. This Sears house was built in 1917. Cindy writes: "Like many early Sears kit homes, this one is so close to the railroad tracks, the vibrations and noise would probably have kept the owners awake at night. "The original owners were William C. and Flonna Hess. William was the proprietor at a local feed mill. In 1920, they owned the house free and clear. William and Flonna had no children, and were still living in the house in 1940." Enjoyed this post, and Cindy's. Probably, people are just passing by this model, because bungalows of one kind or another can be so common, that even researchers just pass them on by. Excellent work, ladies. Great research, Lara, on identifying the architect of this model, and many other Sears designs. This is important work you do, and helps us understand the business end of things. What a gorgeous house, Karen! 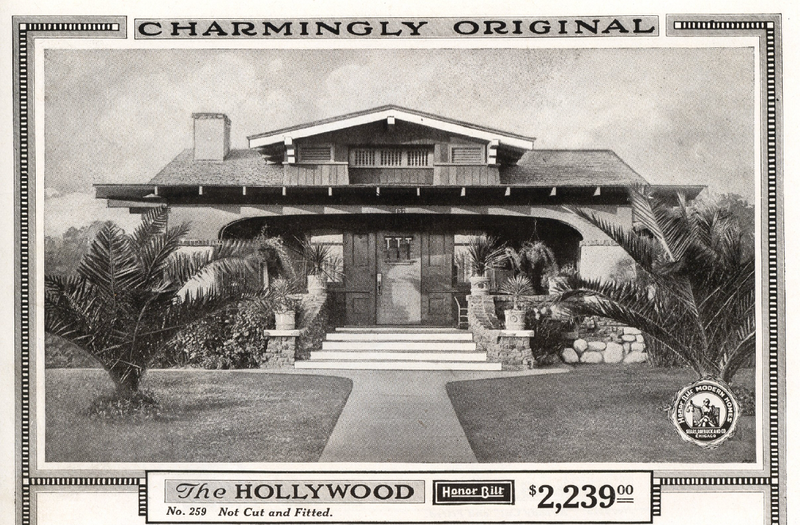 There are Hollywood-like houses out there--I found one in my area last month but it just wasn't a match to the Sears. "Bungalow Magazine" was a popular publication at the time, and I suspect many local builders used its houses as inspiration. We have a"Hollywood" built around 1917 in Fort Thomas, KY. There are at least two others in town. Yoho was a bit of a showman and did not actually have an architectural license and/or degree. This shortcoming was solved in 1911 when he formed a partnership with Seattle architect Edward L. Merritt and Virgil Hall. The company was named the "Craftsman Bungalow Co.". Merritt had an architecture degree from the University of Minnesota, and severed as Vice President/ Supervising architect of the company. Together they finance, designed, built and sold thousands of homes in the Seattle area and beyond.